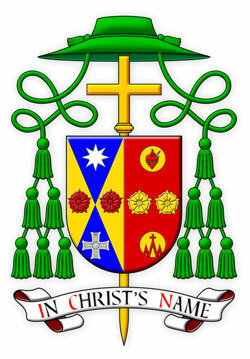 Since coming to the Diocese Bishop Tomlinson has considered the adoption by the Diocese of a Coat of Arms. Apparently Bishop Daly commissioned a Coat of Arms for the Diocese in 1979, but it was never used. With the help of a number of people a suitable coat of arms for the Diocese was devised. As a consequence of the adoption of a Diocesan Coat of Arms, the diocesan coat of arms was incorporated into Bishop Les' episcopal coat of arms, hence the left side of the shield is the diocesan coat of arms and the right his personal elements. the emblem of St Patrick’s Cathedral - recalling his period of service as a priest and bishop in the Archdiocese of Melbourne. The motto “In Christ’s name” recalls the invocation preceding the priest’s entry onto the sanctuary at the beginning of the Mass and encapsulates the dedication of all efforts for the sake of the Gospel. In the language of heraldry, the arms are blazoned as: Gules in fess two roses between in chief a bezant Or charged with a Sacred Heart proper and in base a bezant Or charged with three chevronells conjoined the centre one throughout terminating in a Latin Cross Or. The arms were designed by Richard d’Apice and Fr Guy Selvester and illustrated by Sandy Turnbull.